Preheat the oven to 200°C/gas mark 6. Lightly grease a 12-cup muffin tin. Mix together the flour and cheese in a large bowl. In a separate small bowl, whisk together the milk, egg and oil. Add the vegetables and ham to the bowl with the flour and cheese, then stir in the wet ingredients and mix thoroughly until fully combined. Divide evenly between the muffin cups and bake in the oven for 25 to 30 minutes, until golden brown and fully cooked through. Allow to cool before serving. To make the hummus, place the chickpeas, garlic, tahini and lemon juice in a food processor. Blend until smooth, then add the Greek yogurt and blend again. 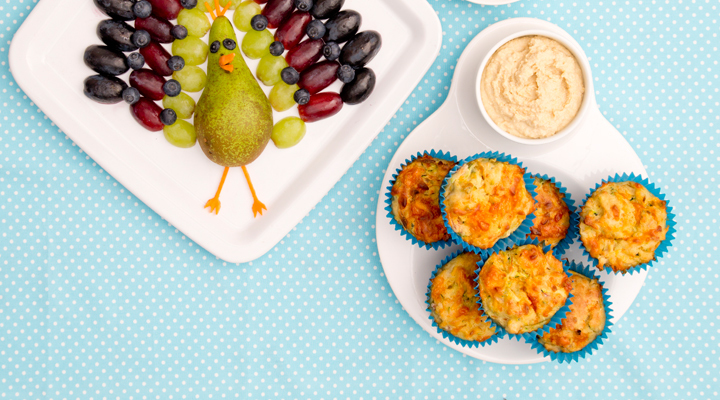 Serve the muffins with the hummus on the side.